After countless days and nights of hard work the book is finally done. I’m very proud of it. I’ve written something that I would have wanted back in the days when I just started to pull the threads of the fabric. This piece of philosophy will guide you through every step in dismantling the notion of the external world. It will ruthlessly and effectively reveal and dispel any wrong-thinking surrounding this idea upon which all else stands. This isn’t the first book that tackles this subject. But others have left it at “we can’t really know whether there’s anything beyond our experience,” while I go all the way and say that we can know – and in this book I’ll show you exactly how and why this idea of an external world beyond our perceptions is nothing but a figment of our imagination. But this is a book for serious people. You won’t find any ‘pointers’ in it. What you’ll find is stone cold logic hacking away at the very foundation of existence itself. And in it’s wake; when the dust settles; you’ll recognize that, not only were the words of the sages true all along, but they’ve gone from being a remote possibility to being the light and guiding principle of your life. What words? 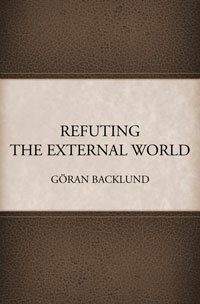 The book is called Refuting The External World and is available as a downloadable E-book. Effortless action on the head of pin. Ended a few faltering thoughts I was still saddled with. loved the free chapter. Must get your book soon. Thanks for your clarity and honesty. I think you’ve read my early articles and not the book!